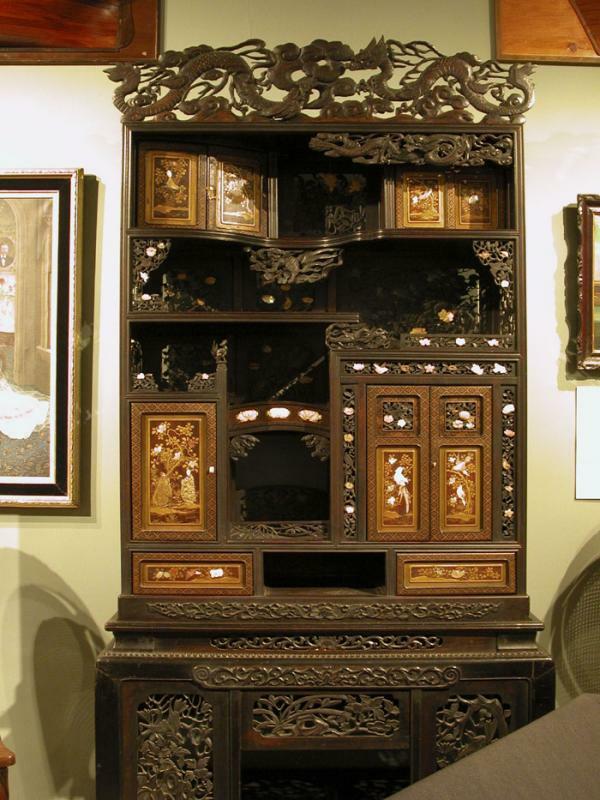 Chinese cabinet purchased in Hong Kong in the 1890s by Capt. Eben Curtis of Searsport, while master of the ship Tillie E. Starbuck of New York. The Tillie E. Starbuck was one of America's first iron sailing vessels, built by the John Roach yard in Chester, Pennsylvania in 1883. Curtis became her master in 1891. 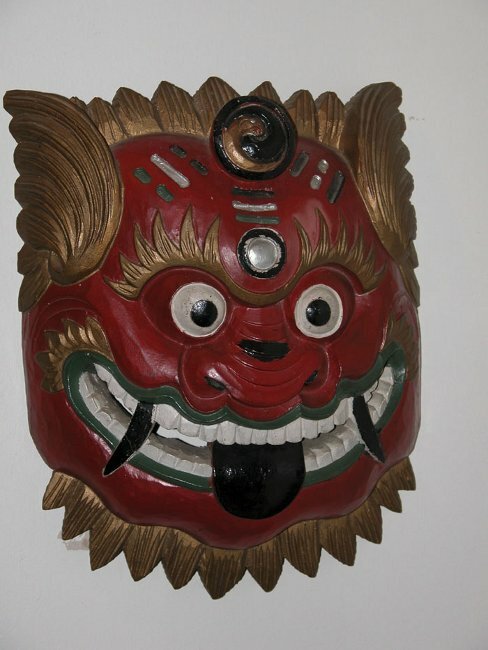 Chinese devil chaser mask brought back from the Yangtze River area by Captain Wilbur Carver of Searsport. He was a young naval officer when he purchased this mask, in service on the China station in the 1930s. 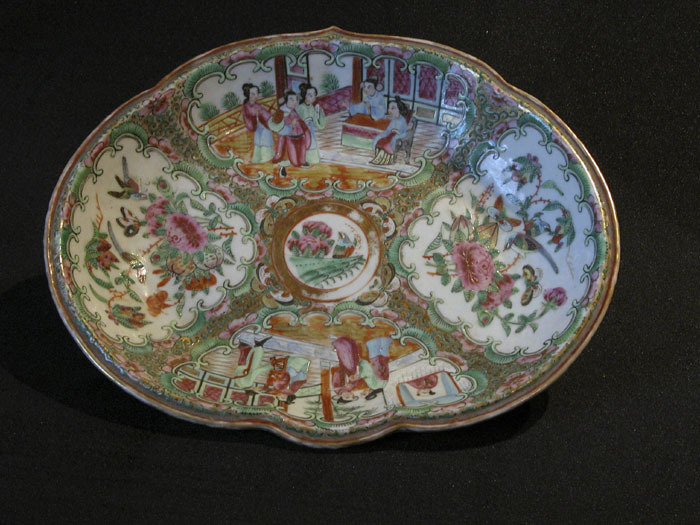 Chinese Rose Medallion platter brought back by the Dow/Eaton family of Searsport. 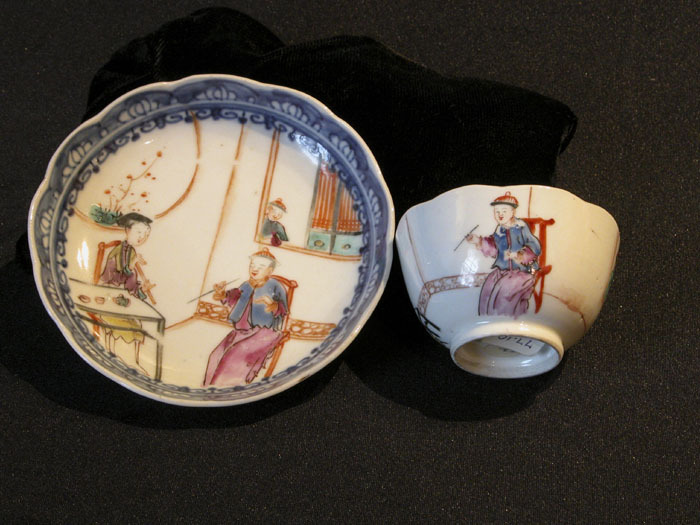 Chinese export ceramic tea bowl and saucer, with scalloped blue and white border and enameled decoration. Design has Mandarin man and his lady at the tea table and a boy at the window. 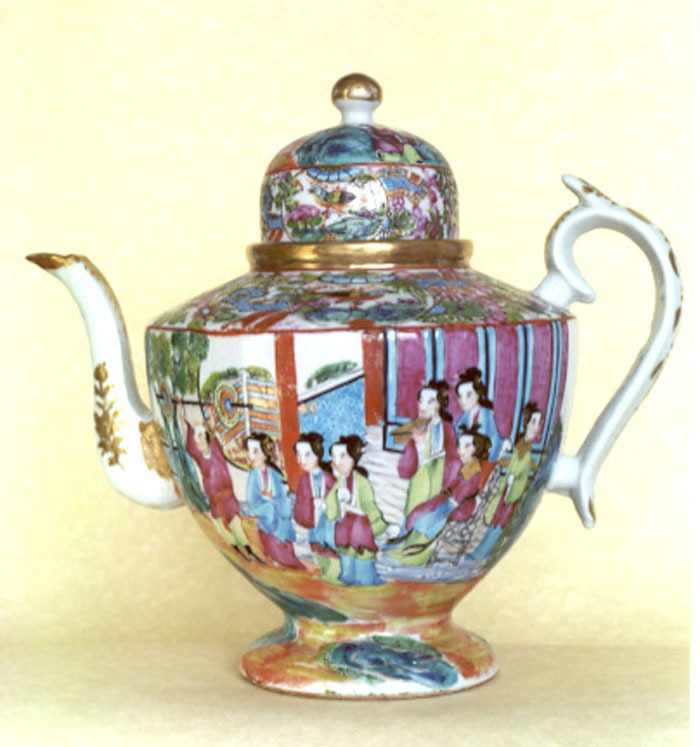 Chinese export ceramic teapot, with a scene showing people playing with a dog. It's likely that the Japanese artist who created this had bodies ready on which all was needed was a head portrait of the buyer. 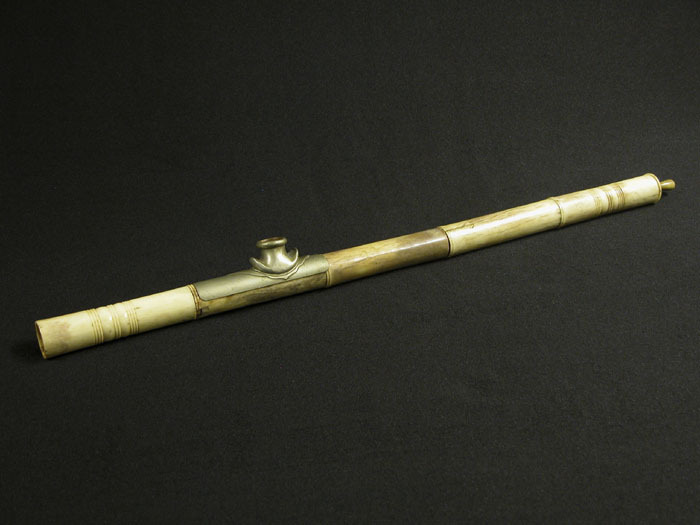 Searsport's Captain Frank I. Pendleton (1848-1915) had his family with him on this voyage, and similar scrolls were painted of them, but not as samurai. 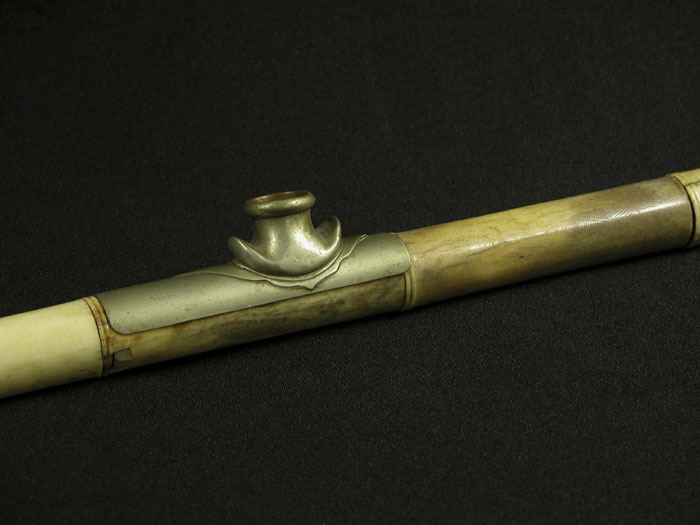 Opium pipe of carved ivory. 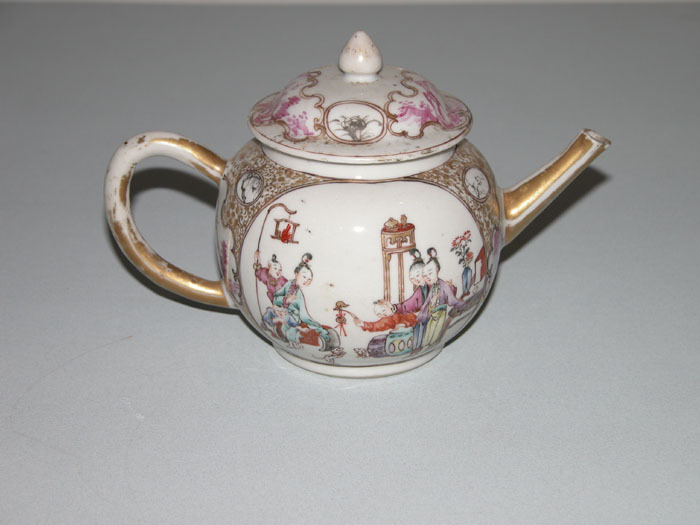 Chinese export porcelain teapot, Mandarin pattern of the early to mid 19th century in the Famille Rose colors, a color named for the pinkish reds. Laquered sewing boxes like this one were frequently found in Maine deepwater captains' homes, a useful gift or something that a captain's wife might have bought for herself when shopping in Canton. 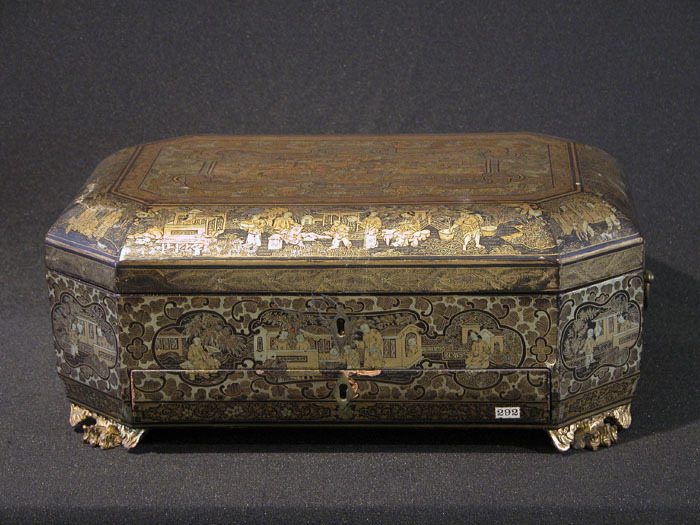 Chinese lacquered sewing box from Canton. 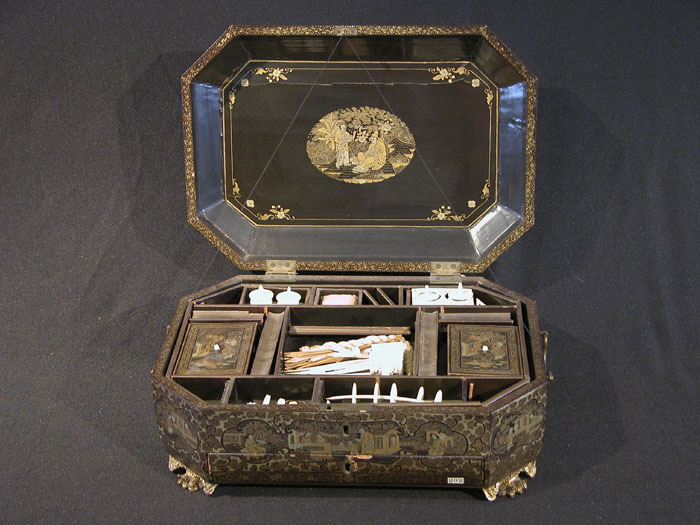 Gilt chinoiserie, with carved ivory implements inside. 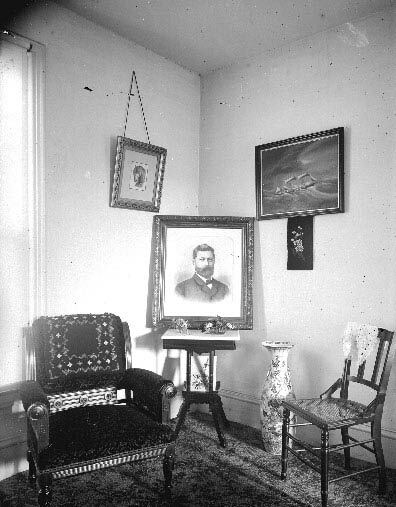 Inside parlor of a Searsport house, possibly that of the photographer, Frederick R. Sweetser. 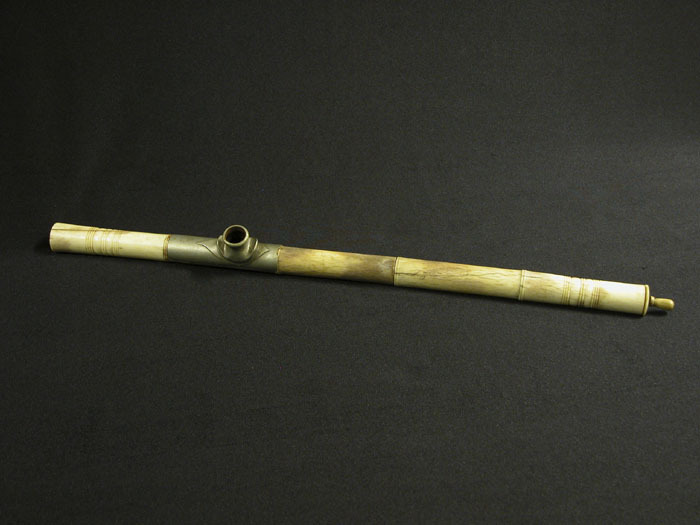 It shows some of the decorative styles of the late 19th century and the types of items brought back home from far-away ports.